One of the questions I get asked most often is where to buy door hardware that looks expensive and modern but doesn’t cost hundreds of dollars per knob (!). I always direct my friends to Kwikset’s Halifax and Milan levers. They are heavy duty and super affordable and I LOVE the sleek design. 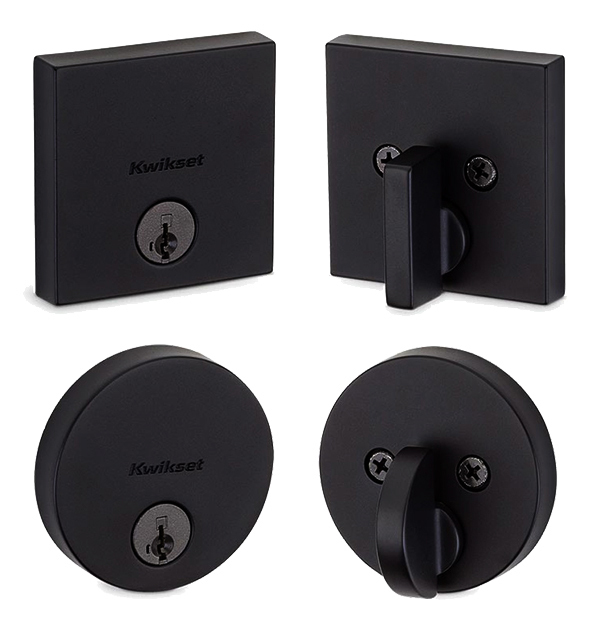 I was also thrilled to hear that Kwikset recently released a deadbolt series that pairs perfectly with my beloved Milan and Halifax series. How gorgeous are these Uptown and Downtown deadbolts? They just came out with an Iron Black finish that is the perfect matte black. 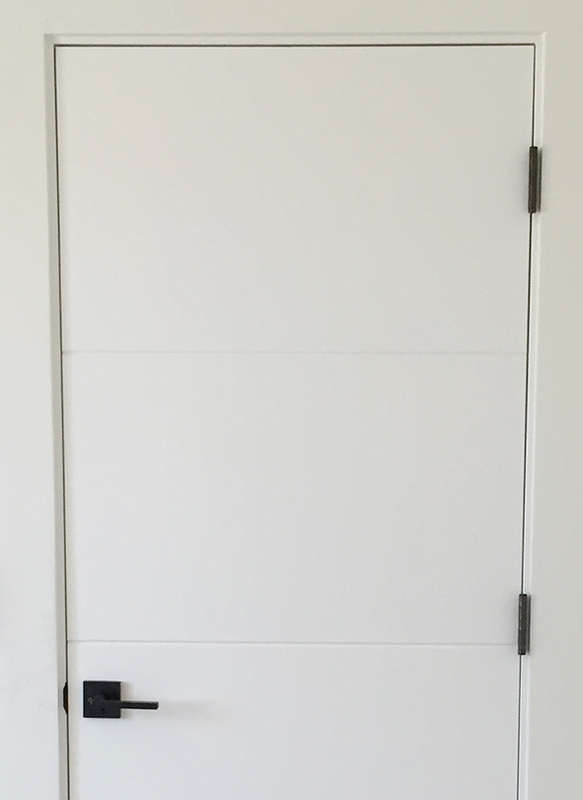 They were used in a local client’s project and I love how they look on the slab doors that we had customized with routered lines. Pretty right? Those kerfed casements are my favorite. I think the look all together is so clean and modern! 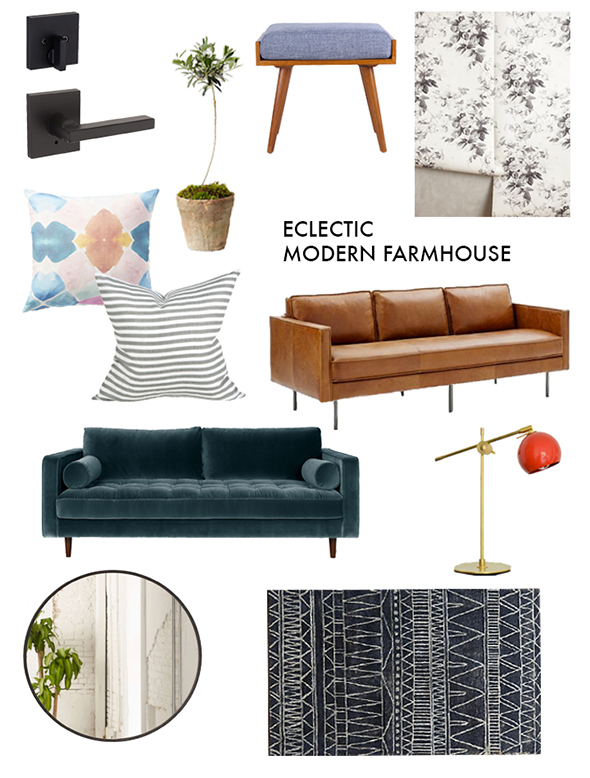 We’re going for sort of a modern farmhouse look in this home and here are a few of the pieces I’ve been eyeing for their living space. I LOVE the mix!! Disclosure: Kwikset is a sponsor of LGN. As always, all opinions are my own! My house was built in the mid-80s and still has the original door hardware. I would like to use something like these matte black levers here but I don’t want to change all the hinges that I have. 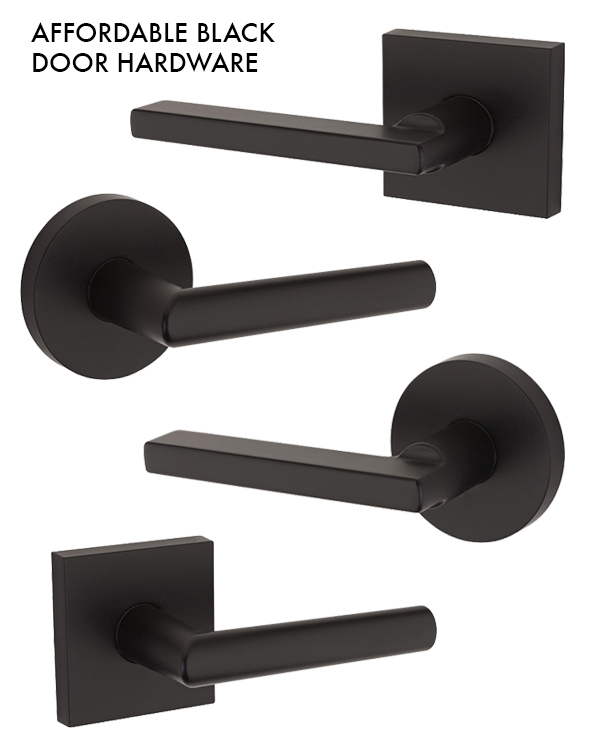 Can I mix these black handles with my current antique brass hinges or do they need to match? I think you could easily mix and match! But it’s actually not all that big of a deal to change the door hinges too? Maybe you do a few key area doors now and if you like it (or if the brass is bugging you), it would be easy to keep going with your other doors later! We changed out all the handles to black in a 70’s build we lived in for years. But the home had A LOT of doors and to replace all the hinges was going to add up to a couple hundred.. I thought I’d just give spraying them out a chance before investing the cash. I spray primed them first and then sprayed them out with just plain old matte black spray paint (we removed the hinges from the doors as we were painting those as well). We just recently moved and after nearly 4 years of use the hinges still looked great. No chipping or wearing! As the Striding Man may have stumbled on this one so must I search out a new Scotch. I have grown a palate for Gleemorgangin, single malt, 12 year old, Lasanta to replace my dwindling stock of GL. I will be more than happy to investigate Cragganmore and Glenfiddich 15 Solera as suggested. I was wondering the same thing as Shannon. How about spray painting the existing hinges to match? Very Nice Find for Sleek and Modern. Thanks! Jenny can you tell us about the beautiful brass doorknobs in your cabin snapchat? Thank you! Do you remember the style name by chance and also the finish you went with? I have never heard of kerfed casements, but as a lover of clean lines, they had me at hello. 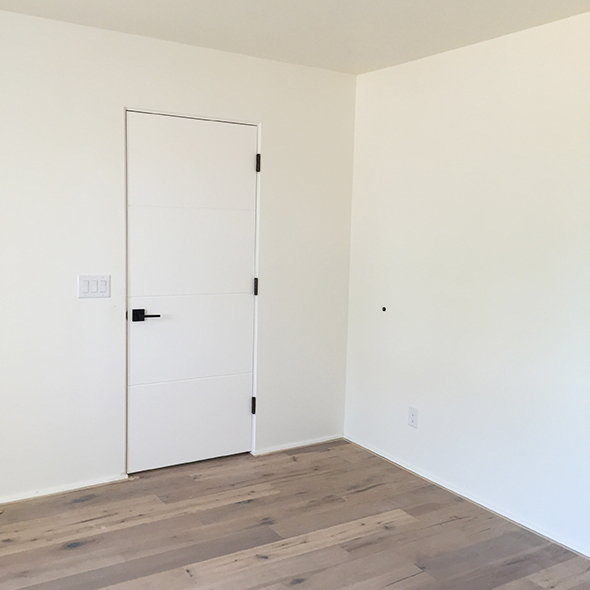 I have traditional molding around my doors, is there a way I can change what I have for that modern look? Many thanks. P.S., love the design of the room. That little cushioned mid century piece has my heart. It’s a great look, right? It would be hard to do without replacing your entire door and jamb. But I will say in the playroom redo we did recently in our house, I had never gotten around to replacing the old door moulding we took down in the interior of the closet when we updated the floors and trim after first moving in. Out of laziness and curiosity, I tried to get the kerfed jamb look by using drywall tape and mud over the gaps between the wall and the old jamb and it actually looks pretty dang good! I’ll let you know how it holds up! Kerfed casements! Now I know what our door “trim” (or absence of it) is called. We live in a 1930s house in CA and have bullnose kerfed jambs on all the doors. Or perhaps casement is the better word? Wanna do a round up of brass knobs/levers??? If you want other beautiful modern door handles try the ones designed by Bazz. These are super affordable. This is one of the next projects were looking to attack in our home redo. Thanks for sharing! The floors are BEAUTIFUL!!!!!!! Are they the montpellier oiled french oak? Any suggestions for black hinges that match the kwikset black color? I searched but couldn’t find any. I was wondering the same thing. Did you end up finding anything to match? Can you please tell me where those doors are from! Love this look! Do you know if the doors are solid or hollow core? I’d like to recreate this look and wonder if my hollow core doors would work! Thanks!